Rugby Town round off their pre-season schedule this Saturday when Bedworth United visit Butlin Road for a warm-up fixture. 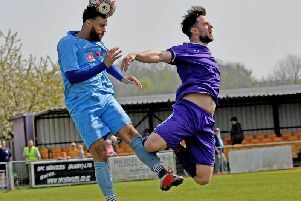 The weekend’s match-up now represents Valley’s only home friendly of the summer, after United’s fellow Southern League Premier Division Central side Alvechurch pulled out of the planned game tonight (Thursday) due to their County Cup commitments. A further home outing against Evesham last Saturday had also been scrubbed off at late notice, and was duly replaced by a trip to NPL Premier Hednesford, with Town acquitting themselves well against a strong Pitmen side - narrowly losing out by two goals to one at Keys Park. For the second game running, Rugby contained opposition from two levels higher in the non-league pyramid to a goal-less first half - creating a number of decent chances of their own in the process. Two Hednesford goals within five minutes - both headers from Dan Cockerline and Reece King - gave the home side the advantage after the restart, although Danico Johnson was soon reducing the arrears when he seized upon a defensive mix-up to ease the ball home. Johnson nearly earnt his side what would have been a deserved draw late in the game, but was denied by a first class stop from Hednesford keeper James Wren. Valley then made the short trip to MFL Division One side RC Warwick on Tuesday evening, where the two teams ultimately played out an evenly-contested goal-less draw. Lewis Rankin had seen his effort strike the bar and Luke Edwards had drawn a decent save from Ryan Young, whilst the first half also saw ex Leamington and Coventry City striker Ben Mackey twice go close for the hosts - who had ex-Town man Sean Castleton in the heart of their defence. The second period was a more turgid affair though, as both sides struggled to break down their opposing defensive lines. One bright note for Rugby saw a first appearance from the bench for ex-Rushden skipper Richard Bunting, after the midfielder had struggled in pre-season due to a calf injury. Saturday’s visitors will also start the 2018/19 campaign two steps higher than Rugby, following their promotion at the end of last season via the NPL Division One South play-offs. The Greenbacks’ latest elevation represents a third appearance at Southern League Premier Division level within the last seven seasons, with United supporters hoping for a longer stay this time round after their two previous visits in 2012/13 and 2015/16 both only lasted for one year.